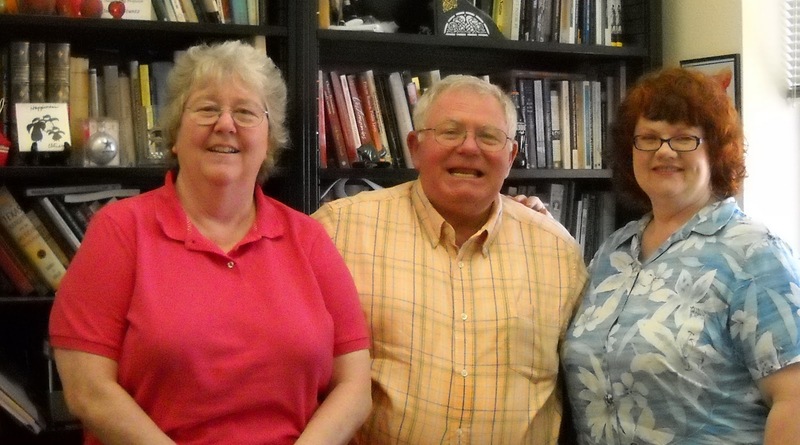 ﻿My wife Vicki and I earlier this week had the chance to visit with Dr. Jean Stuntz in her office at the History Department of West Texas A&M University in Canyon. We learned a lot from her about the current status of online history teaching. Dr. Stuntz is currently the President of H-Net, the massive and worldwide cooperative site that is the internet crossroads for the historical profession in the United States and around the globe. As its website notes, H-Net is an international interdisciplinary organization of scholars and teachers dedicated to developing the enormous educational potential of the Internet and the World Wide Web. Dr. Stuntz is a trailblazer in using the Web for university-level history teaching. She beli eves that students learn best when she gets them started and then stays out of their way. 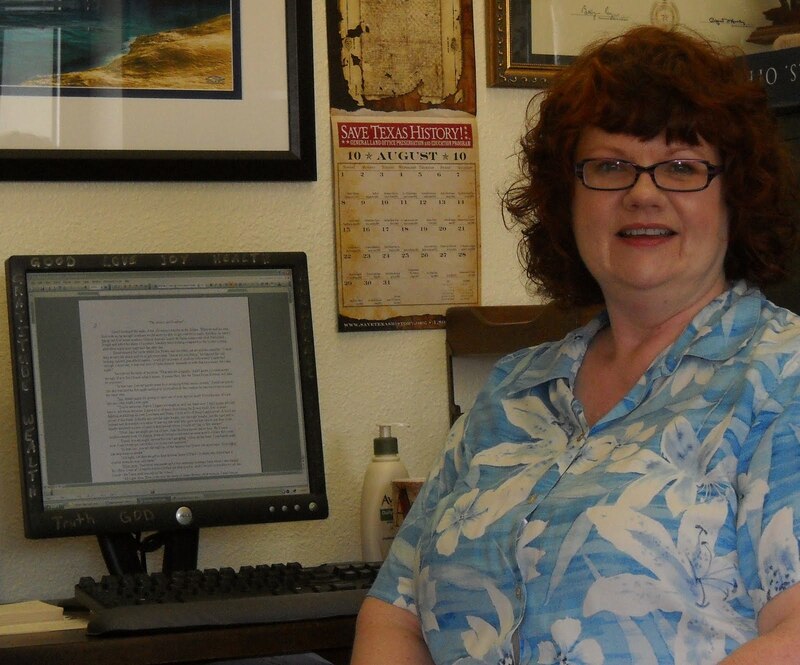 She has therefore created online classes in all of her teaching fields so students around the world can get acquainted with Texas history, U.S. women's history, and the Spanish Borderlands. She uses the latest technology and modern teaching methods to allow students the widest choice of learning options and thus increase their ownership of learning. Born and raised in Orange, Texas, Dr. Jean Stuntz received her B.A. and J.D. from Baylor University and Baylor Law School in Waco. She earned her M.A. and Ph.D. from the University of North Texas in Denton. Dr. Stuntz began teaching at West Texas A&M in the fall of 2001. She is the author of the book His, Hers, and Theirs: Community Property Law in Spain and Early Texas, (2005), which won the La Presido Bahia and TOMFRA awards. She also authored a chapter on Minta Holmsley in Texas Women on the Cattle Trails, (2006), winner of the Liz Carpenter award, and her articles include "Women of the Texas Revolution" in the Social Studies Texan (2007) and "Prairies to Progress: Women on the Texas Panhandle Frontier" also in the Social Studies Texan (2009). 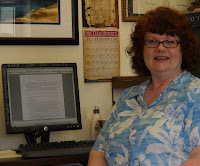 She is currently working on a book about women pioneers of the Panhandle. Dr. Stuntz teaches Texas history, U.S. women's history, Spanish Southwest, historical methods, U.S. history surveys, and world history -- and in so doing she is never far from a computer. 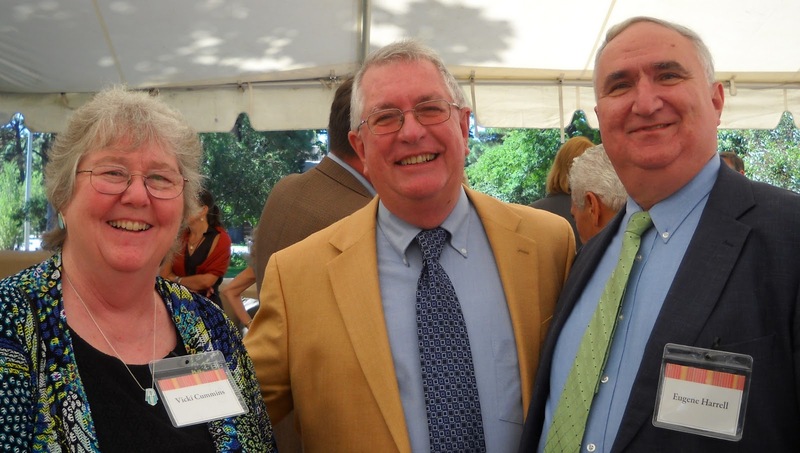 ﻿Today over a hundred people from all across the United States and Latin America gathered at University House on the campus of the University of New Mexico to honor Professor Richard E. Greenleaf, one the most distinguished historians of colonial Mexico. The author or editor of eleven books and countless articles, Professor Greenleaf directed the graduate careers of well over three dozen Ph.D. students during a forty year career at the University of the Americas, Tulane University, and the University of New Mexico, He spent most of his distinguished career as the France V. Scholes Professor of Latin American History at Tulane. The﻿ occasion marked the publication of a new book entitled The Inquisition in Colonial Latin America: Selected Writings of Richard E. Greenleaf, edited by James D. Riley, a former Ph,D. student who is an emeritus professor of history at the Catholic University of America. This book provides a survey summary of Dr. Greenleaf's extensive arrary of publications and historical analyses of the Inquisition in colonial Latin America. During our recent trip though west Texas, Vicki Cummins and I visited the Museum of the Big Bend, which is located on the campus of Sul Ross State University in Alpine, Texas. We were interested in visiting the museum because it is one of the important museums of the state, but also because it was a Texas Centennial Project. The building which houses the museum was built in 1935 with a $25,00 grant from the Texas Centennial Commission along with about $50,000 in additional funds from the Federal Government. It was a state-of-the-art 1936 fireproof structure built entirely of native stone and equipped with ornamental iron window guards and outside doors of heavy steel. As a Texas Centennial project, the building was dedicated "to the pioneers of the area" and initially housed the offices for the West Texas Historical and Scientific Society, an organization that no longer exists. Former Governor Pat Neff dedicated the structure on May 1, 1937. Today the interior of the museum has been completely modernized in a sweeping series of renovations, although the exterior of the building still retains much of its 1936 centennial appearance. The Museum of the Big Bend has an important permanent collection of materials dealing with the art and history of the Big Bend, including the Yana and Marty Davis Map Collection, which "is one of the largest and most diversified selections of Texas maps in the state." A special map room and research area highlights this collection, which is under the direction of Matt Walter, the curator of maps, seen with me above. The general collections and exhibitions welcome an impressive number of visitors monthly. Although for a time the Museum was located in other premises on the Sul Ross Campus, it moved back into its original home under the leadership of Larry Fancell, who is this month retiring after a long and productive career as the director. Mr. Francell is an alumus of Austin College. He will be replaced by Elizabeth Jackson, who has been the associate director. During our visit, it was also our pleasure to visit with curator Mary Bones, who is mounting an important exhibition for this fall dealing with the Sul Ross Summer Art Colony, which during the 1930s existed under the direct on of artist Xavier Gonzalez as a premier place to study art in Texas during the period of Southwestern Regionalism. My wife Victoria and I are spending much of the week at the Archives of the Big Bend, located in the Bryan Wildenthal Memorial Library on the Campus of Sul Ross State University in Alpine, Texas. This fine archive seeks to collect materials that relate to the history of the trans-Pecos region of Texas, meaning the area located to the west of the Pecos River and east of El Paso. Alpine is located in the heart of the Big Bend Country of Texas, and that area is the focus of the collection. There is also an effort made to collect materials that touch on the history of Mexico in the parts of that country that lay to the south of the Big Bend and the trans-Pecos. Its holdings have some 5,000 books in the Archives, mostly dealing with Texana, regional literature, and the history of the region. Important manuscript collections including the papers of Texas Ranger Roy W. Aldrich; Texas legislators Benjamin F. Berkeley, E. E. Townsend and Gene Hendryx; and border historians Harry Warren and Jodie P. Harris. The archives also contains the papers of many individuals associated with Sul Ross State University. It was such interests that brought us to the Archive of the Big Bend. We are writing a biographical study of Frances Battaile Fisk, the author of the 1928 book "Texas Artists and Sculptors." Mrs. Fisk was the sister-in-law of Horace Morelock, who served as president of Sul Ross from 1923 until 1945. During the final years of her life, Fisk lived in Alpine with her sister and Dr. Morelock. We found much useful information about Mrs. Fisk and the Morelocks, especially thanks to the Archive Director Melleta Bell and archivist Jerri Garza. Today I had the pleasure visiting historic Fort Davis with historian Lonn Taylor, who is retired as Curator of the Smithsonian Institution. A specialist in material culture, Lonn knows more about historical sites and artifacts than most anyone I know. It was a hot day, but we spent several hours visiting every part of the fort, which is one of the significant frontier forts in Texas. The fort operated in Jeff Davis County from 1854 until 1891. although it was closed for several years during the Civil War. Maintained by the National Park Service, it is considered to be one of the best examples of a nineteenth century southwestern fort. As was the case with many frontier forts of that era, there were no stockades or walls that surrounded the compound. Instead, its buildings and homes were open. Soldiers from the fort patrolled the region, returning to use the fort as their headquarters base. At various times, the fort was home to the famous ninth and tenth cavalry units. Fort Davis was also the site of the famous trial of Henry O. Flipper, the African-American army officer who was charge with improper requisition of supplies. President Clinton posthumously pardoned Flipper in 1999, some 59 years after Flipper's passing. All in all, Fort Davis is a well-interpreted, excellent historical site at which Texans can learn much about the nineteenth century frontier heritage of the state.